A stunning architectural achievement, it remains in disrepair. Torzhok. Church of the Tikhvin Icon of the Virgin (Old Church of the Ascension). View of tower interior. Aug. 18, 2006. At the beginning of the 20th century, the Russian chemist and photographer Sergei Prokudin-Gorsky developed a complex process for color photography. Inspired to use this new method to record the diversity of the Russian Empire, he undertook numerous journeys over a period of 13 years. His vision of photography as a form of education and enlightenment was demonstrated with special clarity in his photographs of medieval architecture in historic settlements. Torzhok. Monastery of Sts. Boris & Gleb, north view. Far left: Church of the Tikhvin Icon. Summer 1910. As an outpost of the medieval commercial center of Veliky Novgorod, the town was frequently contested. The rise of Muscovite power in the 15th century brought an end to Novgorod's independence in the 1480s, and in 1478, Torzhok entered the domains of Moscow's ruler Ivan III (the Great). The dominant historic feature of Torzhok is the majestic Monastery of Sts. Boris and Gleb, situated on the high right (west) bank of the Tvertsa River and considered by church sources to have been founded in 1038. 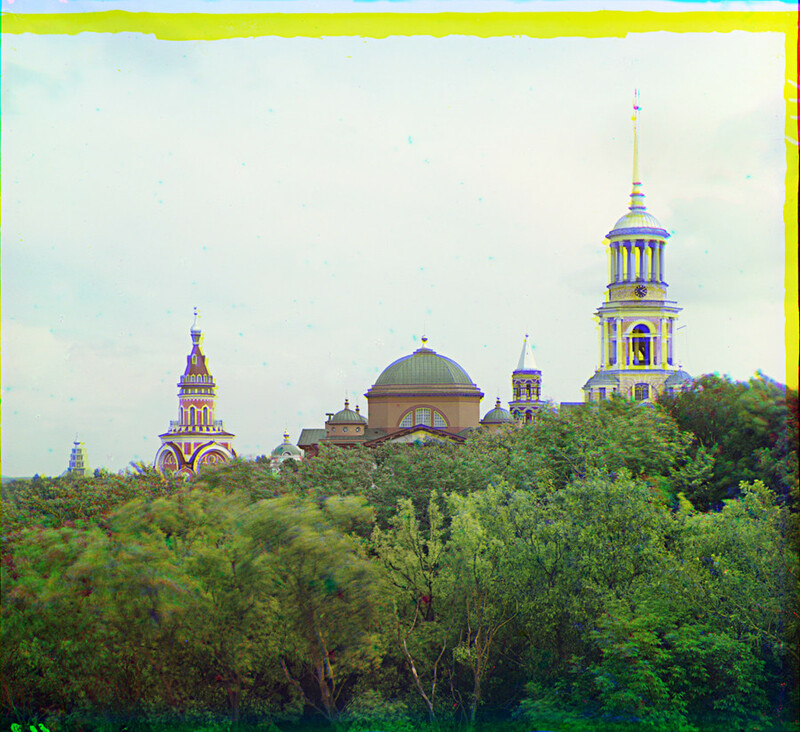 The monastery was the subject of several photographs by Prokudin-Gorsky, and I have documented it in detail. Church of the Tikhvin Icon (Old Church of the Ascension), southwest and northwest views. Aug. 13, 1995. No less remarkable is the wooden Church of the Tikhvin Icon of the Virgin, located a few hundred yards downriver on the same bank, and dimly visible in one of Prokudin-Gorsky’s general views of the Boris and Gleb Monastery. 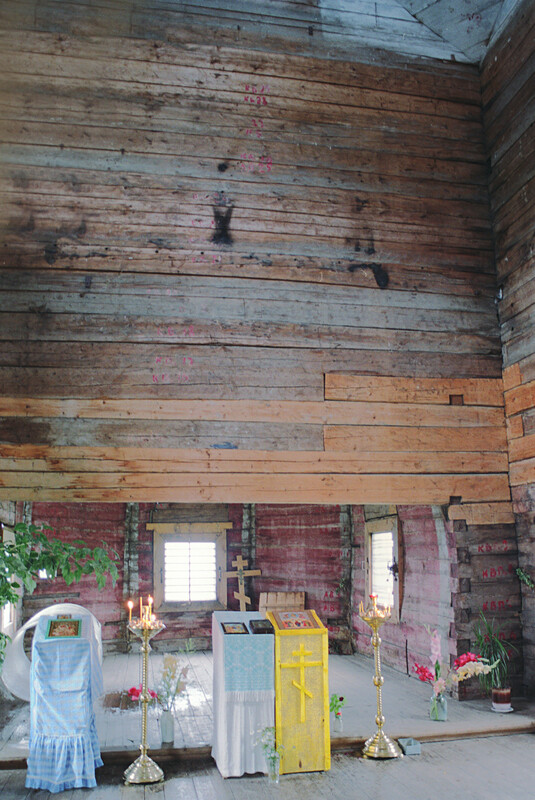 He was obviously intrigued by this log tower, which is among the few wooden churches that he photographed. My photographs of the church were fortunately taken before the appearance of restoration scaffolding in 2007. Church of the Tikhvin Icon (Old Church of the Ascension), northwest view. Summer 1910. 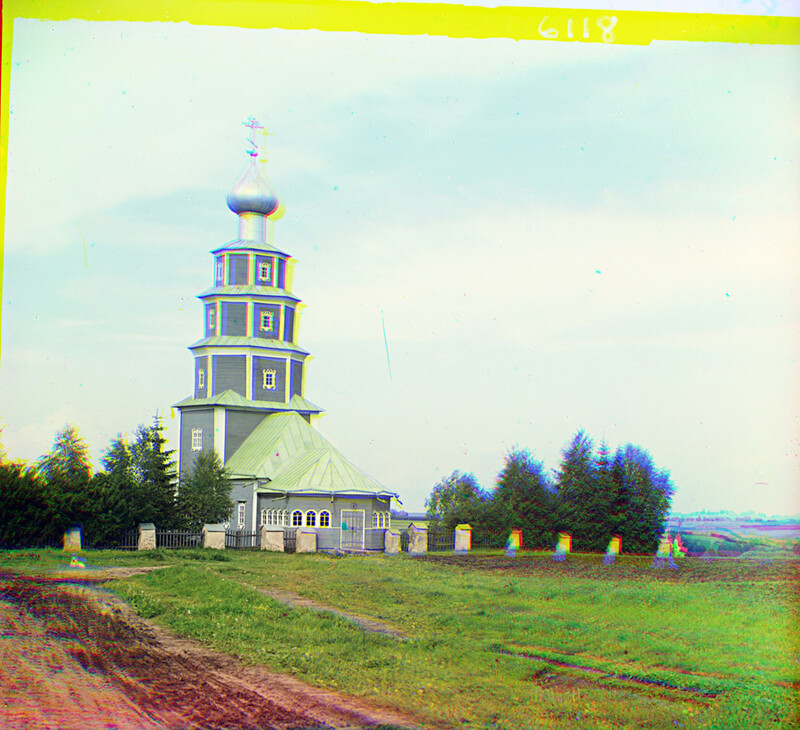 The church was originally dedicated to the Ascension — a dedication appropriately used for soaring tower churches such as Moscow’s renowned Church of the Ascension at Kolomenskoye. 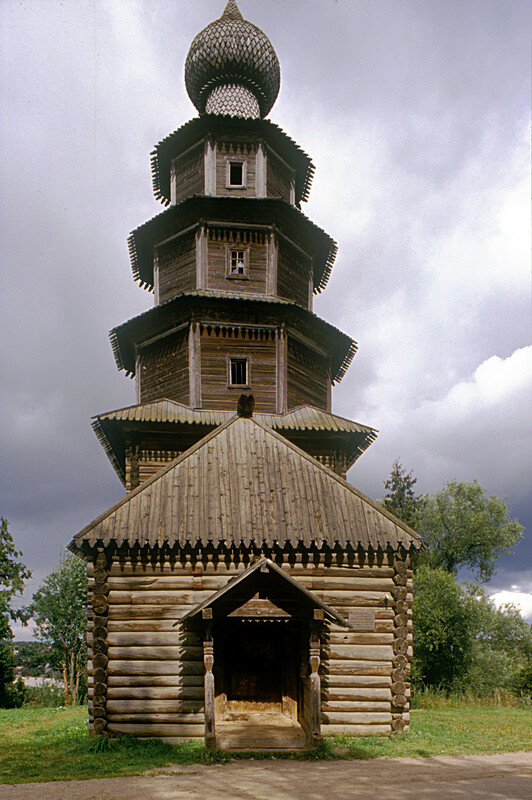 Although the construction date of the Tikhvin Church is subject to debate, one version states that a wooden church was built on the site in the 1650s and then rebuilt in its present form in 1717. The astonishing tower seems to defy gravity as it rises 111 feet in three octagonal tiers over a square base structure resting on a foundation of fieldstone. The west side of the first level is graced with a small vestibule, and the east side has a one-story apse containing the altar. Church of the Tikhvin Icon (Old Church of the Ascension), west view with entrance porch. Aug. 13, 1995. 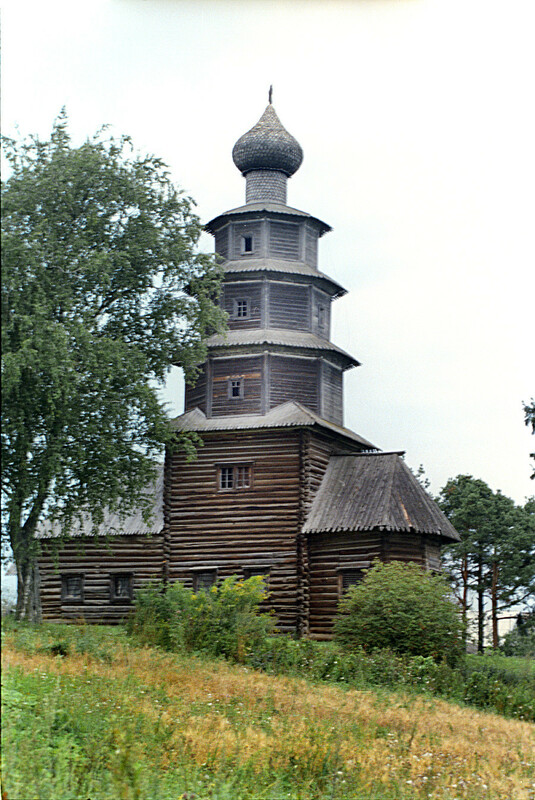 For the most part, the Tikhvin Church consists of closely fitted pine logs joined with notched ends. The logs of the apse, however, were squared and fitted in a tighter dovetail joint. The balance and proportions are breathtaking. The tower is crowned by a single large cupola supported on a thin cylinder. Although a few other examples of tiered churches have survived in Russia, none rivals the height of this one. Church of the Tikhvin Icon (Old Church of the Ascension). Interior, view east from vestibule toward icon screen. Summer 1910. Over the course of a century, the church was frequently modified. In the early 1780s, the foundation was reinforced with limestone blocks quarried in nearby Staritsa. (Log buildings could be braced for such fundamental repairs.) Around the same period, the plank roofing was replaced with metal sheathing. In 1806, the west end of the vestibule was extended with the addition of a narthex, visible in Prokudin-Gorsky’s view. The shingles of the cupola and drum were also replaced with metal sheathing, apparently in 1828. In 1852-54 a new Ascension Church was built of brick nearby, and the wooden church fell into disrepair. Thanks to its unusual, archaic form, local clergy were persuaded to repair the church. During this process, the windows were enlarged and the exterior was covered in plank siding. In 1883, it was reconsecrated to the Tikhvin Icon of the Virgin, although it continued to be known as the Old Ascension Church. Church of the Tikhvin Icon (Old Church of the Ascension). Interior, view east toward altar without icon screen. Aug. 19, 2006. 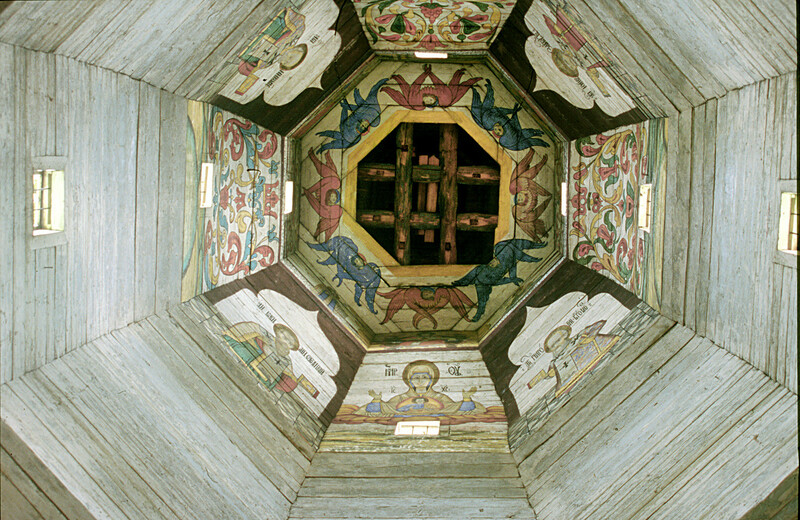 It is fortunate that Prokudin-Gorsky photographed the lower interior of the Tikhvin Church. His view from the vestibule toward the east shows the Tikhvin Icon (left) in an elaborate metal frame. Beyond the arch is an icon screen with the Royal Doors displaying the Annunciation (Archangel Gabriel and Mary). 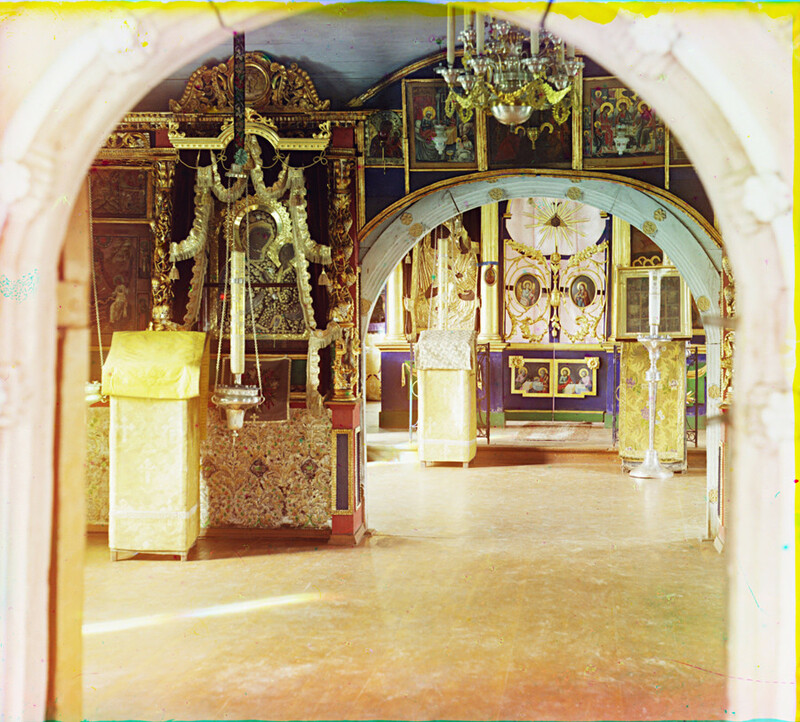 The church was closed by Soviet authorities in 1929, and the icon screen and other sacred objects visible in Prokudin-Gorsky’s photograph were ransacked. Nonetheless, much interior wall painting survived in the tower structure proper, as my photographs show. The upper tiers display 18th-century images of the Virgin Mary and church fathers done in a naïve style with distemper paints. Also visible are floral decorative flourishes in the bright colors of folk art. Additional wall paintings were created in the lower part of the church at the end of the 19th century. Church of the Tikhvin Icon (Old Church of the Ascension). Interior, view of tower and east wall with outline of lost icon screen. Aug. 18, 2006. Prokudin-Gorsky’s process of three sequential exposures in a large camera did not allow upward views, but a clear black-and-white photograph of the interior was published in Yury Shamurin’s invaluable early 20th-century series Cultural Treasures of Russia. 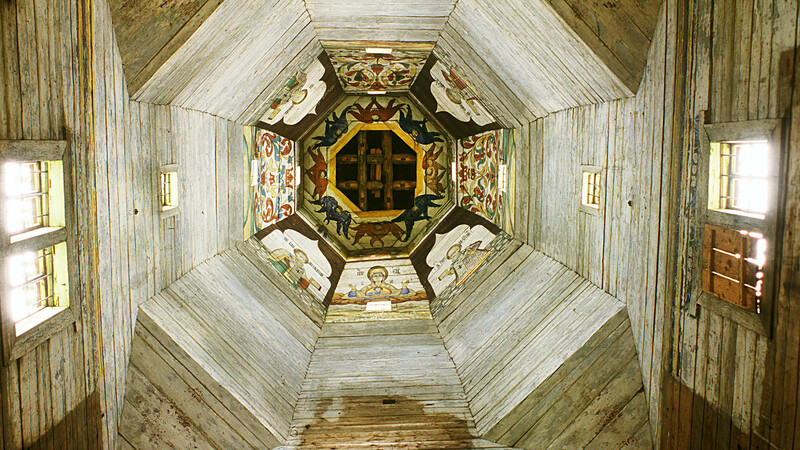 Indeed, it is rare to have an open view to the top in the interior of wooden tower churches. Such interiors were usually capped at the lower level by a ceiling, or “heaven,” which was often painted. 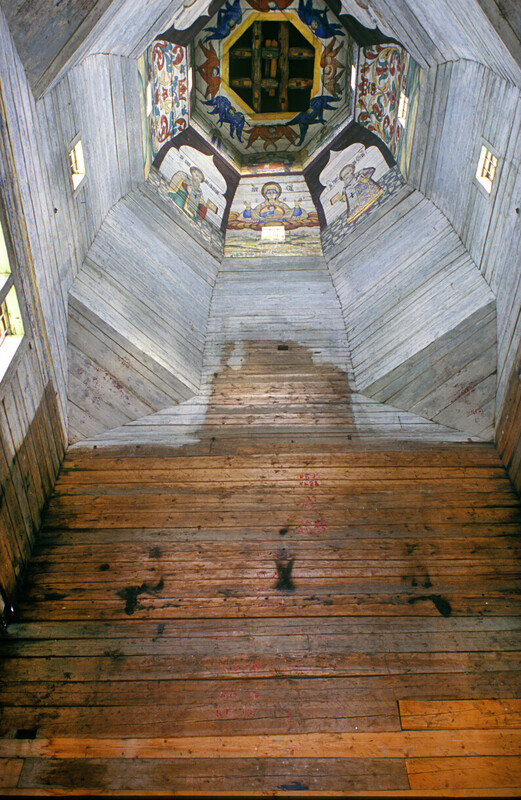 In this distinctive church, the tower logs were worked in such a way to create a level interior surface. Church of the Tikhvin Icon of the Virgin (Old Church of the Ascension). View of tower interior with wall paintings on upper tier. Aug. 18, 2006. My photographs reveal the state of the interior in 2006. The lower part of the east wall shows the ghostly outlines of the lost icon screen. The tiers above show wall paintings in relatively good condition. 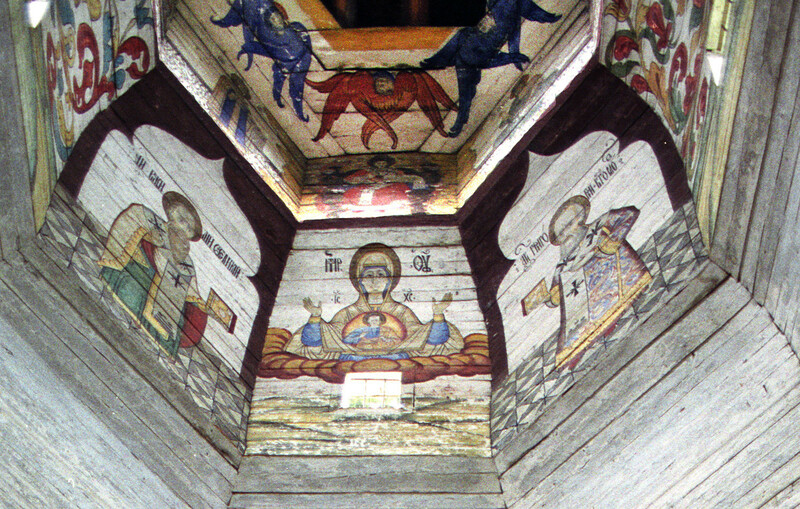 Visible at the top are cross beams that were earlier covered with a panel painted in tempera with an image of the Holy Trinity. The panel was taken to the Torzhok Museum. Restoration efforts in the late 1970s and early 1980s removed much of the plank siding from the exterior and dismantled the narthex, leaving the diminutive vestibule and a small porch. The windows were returned to their smaller size, but the restoration projected was not completed. Church of the Tikhvin Icon of the Virgin (Old Church of the Ascension). View of paintings on east wall of upper tier. From left: St. Basil the Great, Virgin Mary of the Sign, St. Gregory the Theologian. Aug. 19, 2006. In 2006, the church was reopened for worship, as my photographs from that year demonstrate, yet its condition remained too fragile for regular services to be held there. The resumption of restoration work in 2007 led to the seemingly interminable presence of scaffolding that obscured much of the structure — particularly the lower part. Although the scaffolding was recently dismantled and bracing beams were placed on the lower structure, the condition of the lower walls continues to degrade. 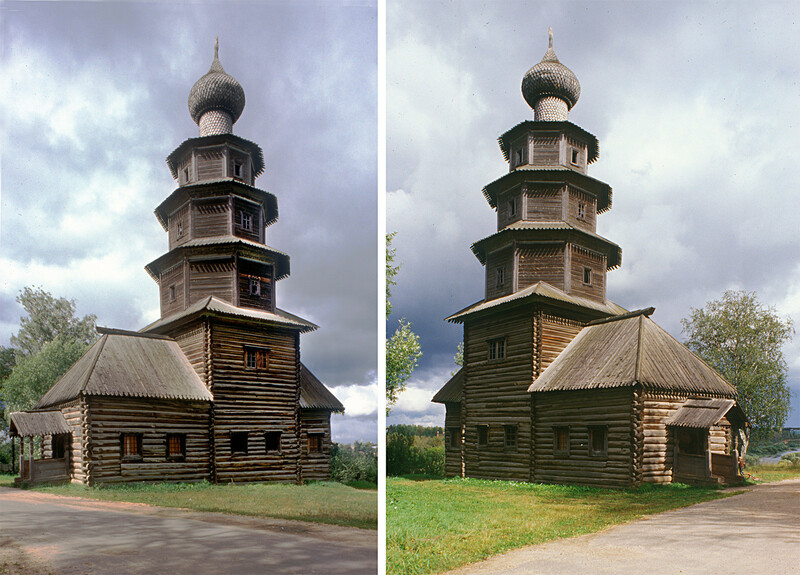 One hopes that the means will be found to fundamentally restore the Old Ascension-Tikhvin Icon Church, one of the most striking wooden structures in Russia. Church of the Tikhvin Icon (Old Church of the Ascension), southeast view. Aug. 18, 2006.